General Hospital (GH) spoilers tease that Genie Francis (Laura) is speaking out about her exit and dropping hints about her return. After Francis was abruptly fired from the ABC soap, Laura was yanked from a major story and shipped off to be with Spencer (Nicholas Bechtel). GH fans were outraged by this shocker, so they quickly made their feelings known on social media. Some viewers vowed to boycott the show until Francis was put back on contract. Others sent angry messages to Frank Valentini, GH’s executive producer. The backlash was enough to make some fans wonder if Valentini might be fired. Francis was clearly upset about the decision to bump her character down to recurring. Her agent insisted that Francis wouldn’t be back unless the story was amazing and it fit in her schedule. 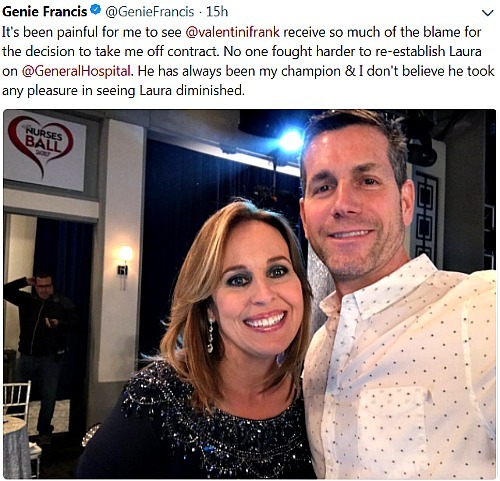 Francis only seemed interested in contract status, which is understandable after decades on General Hospital. However, return buzz started building thanks to a recent Soap Opera Digest blind item. It said one soap vet was being asked to go on contract again. CDL postulated that Francis might fit the bill and it looks like that could turn out to be true. Francis’ latest tweets make it seem like she could have a comeback brewing. First, Francis tweeted about having lunch with Frank Valentini this week. Valentini quoted her tweet and gushed that it’s “always great to spend time with the beautiful @Genie Francis!” Since these two are acting so chummy, it seems likely that they’re cooking up a big return. That’s the only way Francis would have anything to gain from this damage control. Francis argued that Valentini was in her corner. She must’ve been trying to curb all the Twitter attacks. “He has always been my champion & I don’t believe he took any pleasure in seeing Laura diminished,” Francis said. It’s true that Valentini probably didn’t take pleasure in getting rid of Laura and her portrayer. He wasn’t twirling a mustache with an evil twinkle in his eye. 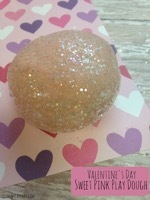 However, Valentini did disregard a prominent soap vet. He’s running the show at GH, so he should be able to take the heat when beloved characters get cut. It just comes with the executive producer territory. Since Francis seems to be changing her tune and helping Valentini save face, that’s a sign of good things to come. General Hospital spoilers hint that Francis could be headed back to Port Charles! Note that the pic with Valentini is on the GH set at the Nurses Ball and Genie looks like she’s wearing heavy filming makeup. We’ll give you updates as other GH news comes in. Stick with the ABC soap and don’t forget to check CDL often for the latest General Hospital spoilers, updates and news. General Hospital Spoilers: Can Elizabeth and Franco’s Relationship Survive Jim Harvey and What Really Happened To Andy?